I'm breaking two of my long ago pronounced rules of nursery decor. Back when I was pregnant with Charly and was sure I was going to be the hippest mom with the most beautiful nursery, I was adamantly against animal motifs and the classic pastel colored nurseries. That was "old school" to me- the teddy bears and elephants and pink and blue was NOT hip and NOT in. I decorated her nursery with Amy Butler prints that were certainly less theme-y than the nurseries I was used to seeing at the time. Remember now, 5 years ago none of us had heard of Pinterest, so trends spread much more slowly. I actually wrote a blog post about Pinterest when I first discovered it and I thought I was the bees knees when it exploded and everyone and their grandma had an account. I was a total Pinterest hipster. Back to the nursery- I loved how I did Charly's nursery- it was sweet. But after two girls and 5 years I was ready for a change. Little miss Lucy could have certainly used the same nursery decor. It's in good shape and still cute. But we're in a new house, and you know, sometimes you just want to change things up. So I settled on the idea of a monochromatic nursery. 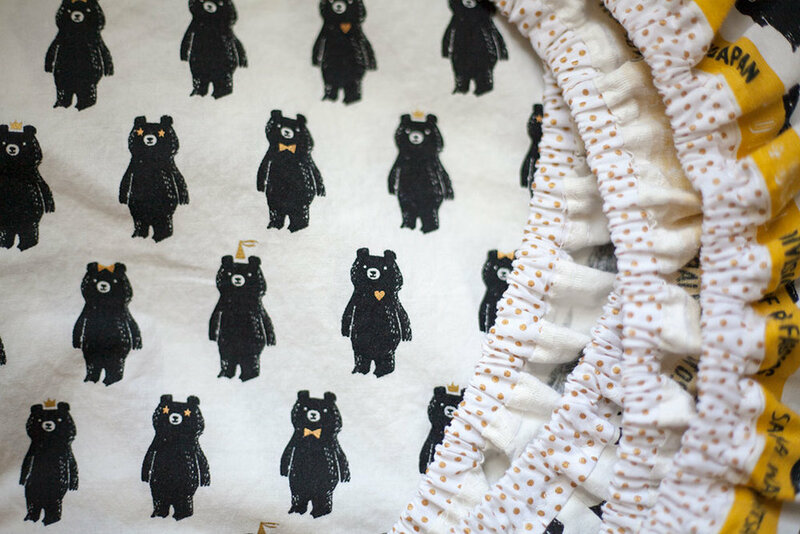 And then I saw this bear print from Cotton and Steel. And I had to have it. The tiny gold details just slay me. Bears wearing bow ties and party hats definitely wouldn't have been on my radar 5 years ago, which is why it's fun to change things up and break a few silly self imposed rules! 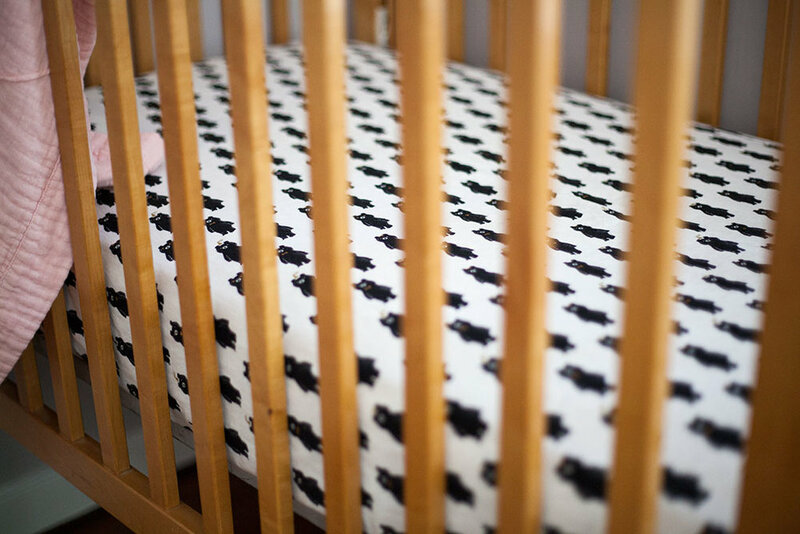 There are lots of good DIY crib sheet tutorials all around bogland (I followed this one), and they're all basically about the same. I strayed from them a bit and here's why: a crib sheet uses the full width of quilting cotton- typically listed as 45". In reality, quilting cotton varies from 41"-45", and that extra few inches can make a big difference to whether your sheet stays on the mattress or not. A narrower fabric will mean less overhang to wrap around the back and hold it on. As it happens, the fabric I used is 42" with selvage included. Rather than narrowing that measurement by 1) removing the selvage, and 2) folding over to form an elastic casing, I left the selvage intact and added a separate elastic casing, giving my sheets a better chance of staying put. It doesn't hurt that this selvage is beautiful in and of itself! This is super simple to accomplish, and means less ironing. Trust me, your fingertips will thank you! I used gold metallic polka dot fabric a friend gave me that was already cut to be quilt binding, which made the process even simpler. After sewing together the corners of the sheet I sewed the binding (already folded with both raw edges together) to the right side of the edge of the sheet all the way around, leaving a small opening for inserting elastic. Once I inserted the elastic I sewed the last bit closed then finished the seam allowance. Although Lucy is 2 months old her nursery is still in progress. Third kid problems, you know. So I'll be sharing her nursery in stages because the rest of it is still very much unfinished- and having some in progress posts might help me keep momentum going to finish it!